UK, 2015, 155 minutes, Colour. 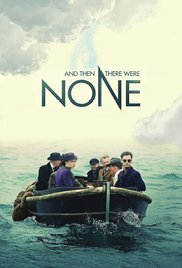 Charles Dunn’s, Burns Gorman, Aidan Turner, Maeve Dermody, Miranda Richardson, Toby Stephens, Anna Maxwell Martin, Douglas Booth, Noah Taylor, Sam Neill. This is a prestige BBC production, screened over three nights. Once again it has a strong cast of character actors, especially with Charles Danve as the judge, Sam Neill the general, Toby Stephens as the doctor, Miranda Richardson as the bigoted woman, Burns Gorman in a better role as the detective, Aidan Turner as the military man, Australian Maeve Dermody as Vera Claythorne, Douglas Booth as the callous young man and Noah Taylor and Anna Maxwell Martin as the servants. The location of the mansion on an isolated island, with its rooms and corridors, the grounds, the cliffs and the sea, gives a good atmosphere to the film. The title is based on the rhyme, originally 10 Little Niggers, arranged to 10 Little Indians and here to 10 Soldier Boys. As the title suggests, there is a diminishing cast, all of whom have been guilty of a crime and are being executed by U N Owen who may or may not be one of the group. Audiences who enjoy Agatha Christie stories will enjoy this one. 1. The popularity of Agatha Christie and her novels? Storytelling, characters, crime, twists and mysteries? Solutions? 2. The popularity of this story, five film versions over 70 years? The issue of the title and the ship from “niggers” to Indians to soldier boys? 3. The 1939 setting, August, pre-war? England in the atmosphere? Social situations, class situations? 4. The introduction to each of the characters, the letters and phone calls, the interviews, the name of the inviter, U N Owen? The group believing the authenticity of the invitation? 5. The gathering, the nature of the group, the boat, going to the island, the vast house, the open space around it, the cliffs, the sea? The rooms, meals, kitchen? Socialising? The details, the cupboard with the recording? 6. The glimpses of the lives of the people invited, the focus on Vera, the swimming, the boy, reactions? •	the judge, an old man, hard, hanging judge, people carrying his cases, polite, kindly with Vera, collaborating with the doctor, the moderator in the searching of the luggage? His retiring to bed, discovered shot? The final revelation that he was responsible, the flashbacks to his judgement of the criminal, going to the hanging, enjoying it, a kindred spirit, except that his victims were all guilty? His plan with the doctor, his reappearance, confrontation with Vera, the noose hanging, his explanations, his kicking the chair away, her mistake about the remaining bullet, the table, the glass of wine, shooting himself and the gun sliding across the table as if he had been murdered? •	The doctor, the visuals of the hospital, his operation? His drinking, malpractice, denials? His reaction, being upset, people suspicions, the examination of the luggage? His trust in the judge? Fears, the drink, the drugs, mayhem? Going out into the night, the judge pushing him over the cliff? The clue of the red herring? •	The general, old school, military manner, the flashbacks, the war, his wife, her letter, the affair, killing the lover? of Mrs Rogers, the asking of the girl and her death? •	The detective, his character, changing his name, is gruff manner, the issue of the gun, lack of trust? The homophobic murder? Flashbacks, seeming kindness, quickly killing the young man? Participating in the drugs and drinking? Increasing fears, his death? •	Vera, the drowning of the little boy, a job, the interview, her involvement in the search, noticing the diminishing statues, the attraction to Lombard, together during the night? The discovery of the doctor’s body, realising they were the last two, Vera getting the gun, shooting Lombard? The further flashbacks to her being with the little boy, lying about her running, letting him go into the water, her relationship with the boy’s uncle, in the court, the grief of the mother, her offering to look after the house, the uncle and his realising the truth, that she had murdered the boy to marry him and get the money? Her memories, going into the room, seeing the noose, putting her head in the noose, the judge coming in, the confrontation, her pleading, the issue of the bullet and her mistake, the judge pushing the chair and her hanging? •	Lombard, his African background, the touch of the callous, the mines and the deaths, the many killed, the motivation? His relationship with Vera, spending the night? The search for the doctor, discovering his body, Vera getting the gun and shooting him? being the first to die? •	Mr and Mrs Rogers, servants, cook, domestic behaviour, at the service of all the guests? The flashback, the mistress, Rogers and his harsh killing, the wife and her nerves, his cruelty? 8. The progress of the deaths, the details according to the Rhine, the statues diminishing? 9. Upset, the gun, searching? The effect of each death? 10. The remnant, the drinking, the drugs, the effect? The continued suspicions, in a group or separate? 11. Audiences and their suspicions about who was responsible? Whether they decided that it was the judge who was responsible?